Happy New Year 2013!! This is my first blog post for 2013. I think it’s good luck to have a sweet treat as a first post for the New Year, it’s a sign that this year will be sweet for us all, not salty, not sour, not bitter, but a very sweet year, or as the kids like to say, “SWEEEEET”.!! Brown Sugar Pound Cake is a dense wonderful cake, perfect with tea, or accompanied with whipped cream and strawberries, as my daughter would prefer. This cake doesn’t have a lot of extra liquid such as milk added to it, as other recipes call for, which makes it more like a bread than a light cake. It reminded me of a brown sugar cookie. It would also be nice drizzled with chocolate or caramel sauce. This is such a delicious dessert, perfect plain or if you would like to add fruit, even better! Grease and flour 9x5x3-inch loaf pan. Add vanilla. In a separate bowl, combine flour, baking powder and salt. Bake one hour or until toothpick inserted in center comes out clean. Remove from pan and turn out on rack to cool completely. Top with whipped cream and fruit if you like. Print Recipe This post has been linked up to these wonderful blogs! Just wanted to let you know your recipe did show up on Foodie Friends Friday link party! Thanks so much for linking up and for bring such a wonderful recipe! I have been thinking pound cake for while now. This one sounds great!! Thank you for sharing at Foodie Friends Friday. I just made this and it is wonderful. This is my first homemade pound cake. Thank you for sharing. I will definitely make this again, probably like tomorrow….lol. 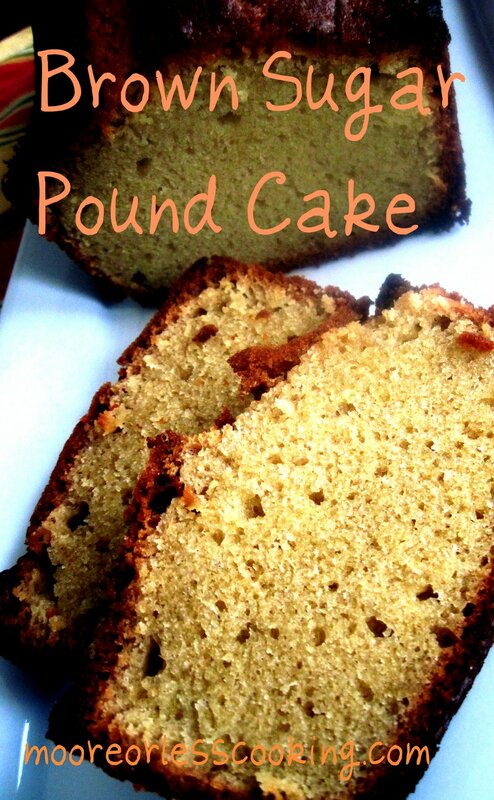 I love pound cakes and this one looks amazing! It sound so moist and delicious. I can’t wait to give it a try! Love pound cake and the brown sugar makes this really sweet.